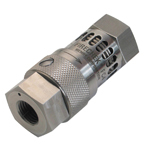 FireChek is a heat activated emergency shut-off valve for 1/4 inch pneumatic air lines. FireChek is used in conjunction with pneumatically actuated firesafe valves and provides a safety shut off valve for volatile fluids. FireChek is an emergency shut-off valve utilizing shape memory alloy which responds to heat to actuate, venting the pneumatic actuator in an upset condition such as fire. When FireChek senses excessive heat from a nearby fire, the shape memory alloy changes state blocking upstream air supply while at the same time vents downstream air, allowing the pneumatic actuator to spring to its fail safe position. Alternate methods for venting actuators in fire conditions like fusible plug or flexible tubing, fail to shut off the air supply. Plant air feeds the fire, making conditions worse for crews battling the blaze. The FireChek blocks plaint air supply, starving the fire of oxygen. The FireChek can be tested on a routine basis to ensure proper operation. A simple heat gun placed next to FireChek allows plant inspectors to trigger the FireChek, sending the pneumatic actuator to its fail safe position. After it cools, a simple twist of the housing resets the FireChek and allows air to flow to the pneumatic actuator again. This entry was posted in Latest News and tagged Emergency shut off valve, Heat Activated emergency shut off valve. Bookmark the permalink.